WASHINGTON (PAI) – Over the dissent of its remaining Republican member, the National Labor Relations Board has rejected McDonalds’ request to split its “joint employer” cases into 31 separate cases involving 161 restaurants nationwide. The board’s early-January decision allows the massive case of McDonald’s labor law-breaking to go forward as one unified case. That lets the NLRB’s general counsel – its top enforcement officer – present evidence in one big case about the joint responsibility of McDonald’s and its local franchises to obey labor law, and their joint liability for breaking it. The McDonald’s case is important because it marks a new field for the labor board, in a new area of work arrangements: franchises. Firms now often use franchising to escape their legal duties to workers, in everything from legal wages and decent hours to obeying labor law. But the board decided last year, in the McDonald’s case, that McDonalds’ headquarters in Oak Brook, Ill., and local franchises are jointly responsible for obeying or breaking the law. 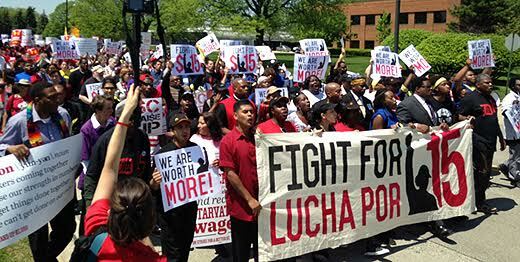 The Fast Food Workers Committee, backed by the Service Employees, brought the complaint against McDonalds. They charged, and the NLRB’s general counsel agreed in his filings, that the fast food giant’s local franchises engage in labor law-breaking nationwide against workers – and McDonald’s headquarters is responsible for the law-breaking, too. NLRB Administrative Law Judge Lauren Esposito ruled last year that all the labor law-breaking complaints, involving both McDonald’s headquarters and its local franchises, could be heard at one time in one big consolidated case. The board backed her in its Jan. 8 decision. Esposito “carefully evaluated and weighed the arguments and properly exercised her authority to regulate the course of the hearing under the board’s rules and regulations and applicable case precedent,” the board majority said. “The case management order” which rolls everything into one hearing and one case – although the hearing itself may be in three cities, New York, Chicago and Los Angeles – “provides for an orderly presentation of evidence that helps to protect each” individual McDonald’s franchise’s “confidentiality and due process rights, as well as controlling the efficiency and costs of litigation for those individual businesses,” the majority added.